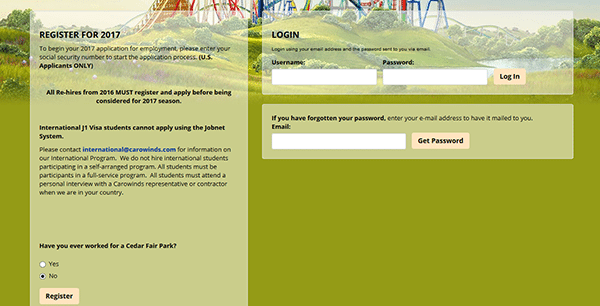 Use the links posted on this page to go to the official Carowinds job application (online version). Numerous job types can be applied for including seasonal, year-round, entertainment, and support positions. Learn more about current job opportunities by visiting the company’s main jobs page. About the Company: Carowinds is an entertainment/amusement park located in Charlotte, North Carolina / Fort Mill, South Carolina. The park was created in 1973, and receives millions of visitors each year. Carowinds is owned/operated by Cedar Fair, a company based out of Sandusky, Ohio. Step 1 – Access the company’s main jobs page by clicking here. Note: The above link will load in a new window/tab within your web browser. Step 2 – Click the button as shown in the below image, or scroll down the page to learn more about the different types of jobs that can be applied for. Step 3 – Scroll down the page and press the “Register” button. May we text you ? Do you want to provide college/temporary address? Step 5 – Press the “Register” button to complete the registration process. 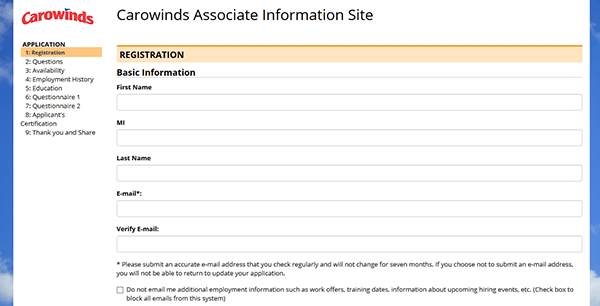 Step 7 – After all of the subsections have been completely filled out you will be able to submit your application. Note: The online hiring process may differ from position to position. The above guide is intended to be used as a basic reference point when going through the online application process.